It’s #FestivalSzn and we are once again partnering with Big Lick Entertainment to bring our community premium entertainment events! Join us May – October for Flat Pickin’ Fridays, Big Lick Burger Fest & Summer Jam, and BOCO BBQ and Country Fest. 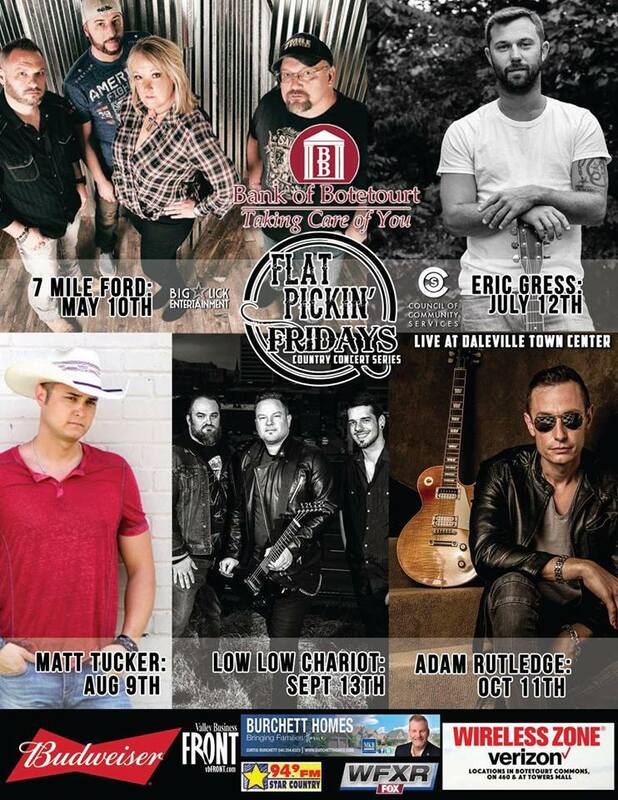 We’ll kick-off our Fifth Annual Bank of Botetourt Summer Concert Series’ Flat Pickin’ Fridays on May 10, 2019, 5:00 – 9:00 PM at the Daleville Town Center. Flat Pickin’ Fridays, 5:00 – 9:00 PM at the Daleville Town Center. $5.00 Entry, 12 and under FREE! 6th Annual Big Lick Burger Fest & Summer Jam, Saturday, June 15, 2019, 1:00 – 9:00 PM at Elwood Park. $10 Entry, Tickets on sale now! Music by Platinum selling, Grammy & ACM nominated country music artist David Nail to headline! BOCO BBQ and Country Fest, More information coming soon!